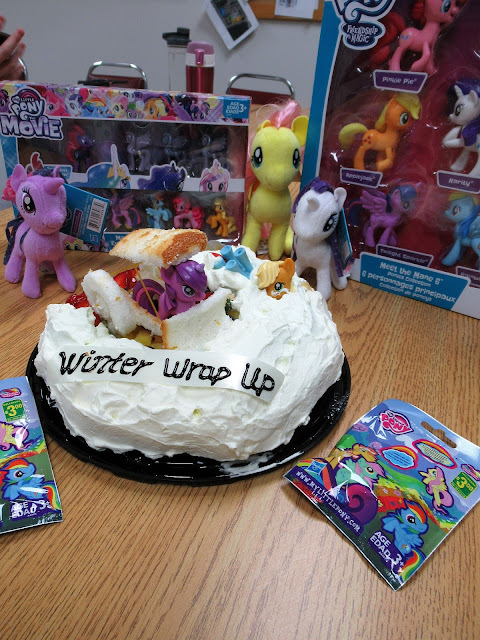 The Winter Wrap Up cake survived the car trip to my workplace unscathed! will linger on for weeks to come. Some music to help start the evening? Flash is back with another edition of his little gaming series! Get it up above. Ready for some more fanfic readings everyone? 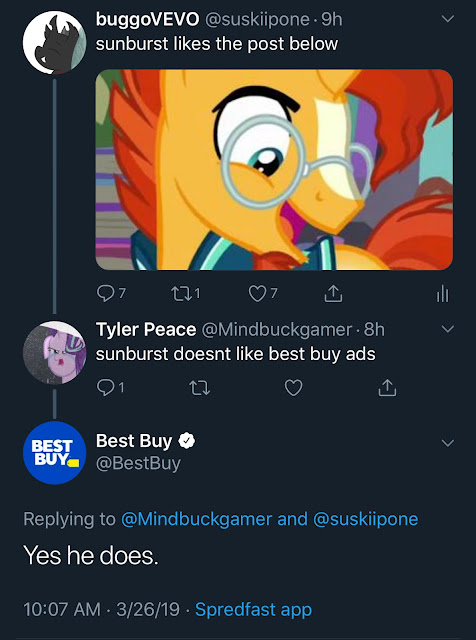 Looks like Best Buy thinks Sunburst likes Best Buy ads. Oh the silliness you find on Twitter. "HOOO! It was a JOURNEY to get this far, but here we are! Scene one is officially complete aside from possibly some more touch ups and, of course, adding all the fun stuff come video editing. The point is, we're making progress! And so, we have our very first teaser, a moment from scene 1! A major thanks to all our fantastic VAs and artists who helped out on this project. Not every VA and artist in this project is shown here (obviously), but seriously, thank you, all of you. And a giant thank you to VChart who spent all day getting scene one edited! I hope you all enjoyed it and are as excited as we are for Conquest!" Alan Back has a bunch of new transcripts for you all to dig into! Get them all down below. Thanks to everyone who came and made it an enjoyable night. 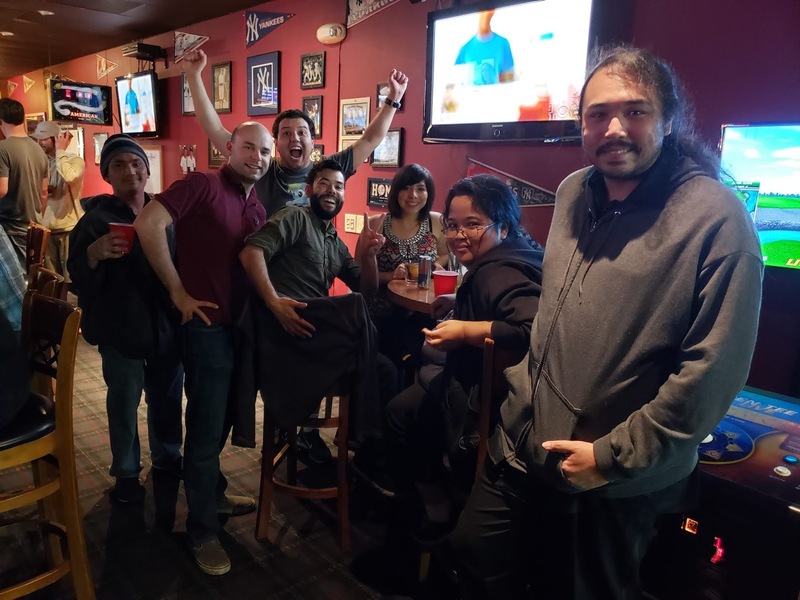 Let's continue this local fandom alive with more meetups in the future. 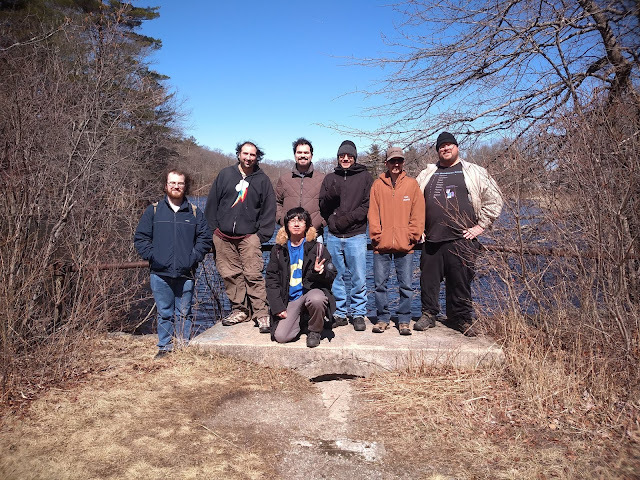 The Bronies-Boston Meetup Group celebrated the arrival of Spring with a hike at the Blue Hills Reservation in Quincy, MA 3/23/2019. Later we went to the South Shore Plaza mall for burgers at Red Robin. Come join the fun! sorry about it not being close to studio standard, but i believe it can still get the job done. Hi there! This is StatManDan and I am hosting a game called “Pointless Ponies” at Whinny City Ponycon on Friday, April 5th, at noon CT at the Hyatt Regency Schaumburg. Based on the BBC game show where the lowest scores are the biggest winners. Knowledge of the obscure is most rewarded in this game of “Family Feud” in reverse. Lots of prizes on offer to those who ignore the obvious and explore the obscure! I NEED YOUR ANSWERS FOR THE GAME! Your participation is important to the success of the show and greatly appreciated. "The people who run the St. Louis Crystal Fair has announced an Amazing Race inspired event in April." Doctor Whooves Auditions Are Open! "Will be needing two versions of Doctor Whooves for two upcoming fan projects, please consider on auditioning for them!" 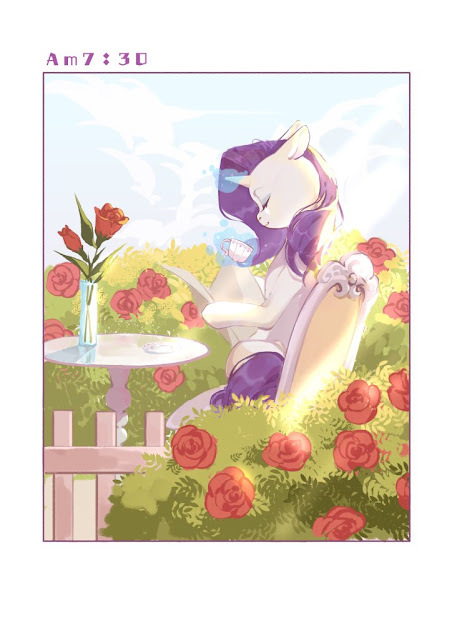 On this weeks episode reviews, Norman Sanzo, Silver Quill, Sapphire Heart Song and Torterra1324 review the 63rd issue of My Little Pony Friendship is Magic. Join us for our fun filled review, it going be an amazing episode!!! "Why 'No Second Prances' is the Most Well Written Episode of S6"
....I don't think I'm going to make many friends with this statement. It's hard enough that I'm one of the people who supports Starlight Glimmer's redemption arc and forgave her for her past, but now I'm coming out and declaring one of the most controversial episodes of season 6 to be, in my eyes, the best writing from season 6. And not just by comparison or process of elimination. I liked season 6 overall and thought it had some real gems (Top Bolt, Flutter Brutter, Stranger Than Fan-fiction, and Gauntlet of Fire were some of my favorites). But even on my first full binge, I thought No Second Prances was the best episode. And over time, my love for this episode has only grown, to the point where I consider it to be one of the top 5 best episodes of the series overall now. So before people grab their torches and pitchforks, or any other sharp and long household tools, please hear me out. 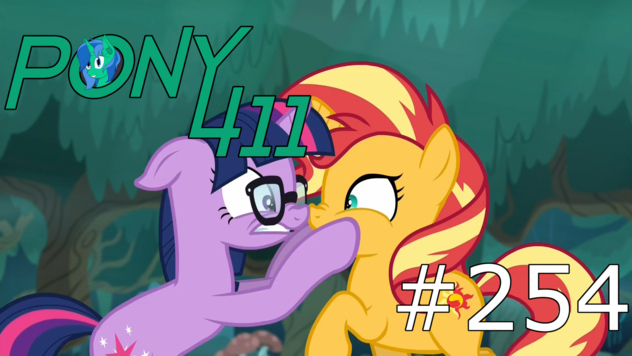 On this weeks episode reviews, Norman Sanzo, Silver Quill, Sapphire Heart Song and Torterra1324 review the 8th Season of My Little Pony Friendship is Magic Episode 21 A Rockhoof and a Hard Place. Come and join us, it's going be an amazing episode!!! King Grover dreams about making out with Pinkie Pie, with whom he is deeply, madly, desperately, aching in love! “Dratta Talks is a Brony News YouTube Podcast discussing various elements of My Little Pony from the Fandom, to the show, to the CCG. "I had a feeling that not very many people knew about the Season 9 villain, so I put together a video explaining who he was and what effect he might have on the season premiere." Nemesis and Alca7raz then have two comics to talk about. The first is Friendship is Magic #76, the continuation of the Cosmos arc. The second is IDW Synergy, a not entirely pony comic focusing on women who work for IDW. Then it's "Spring Breakdown," The new Equestria Girls special. In which they're on a boat, and Dash is convinced that there's evil magic. Which upsets everyone else. Tune in! On this weeks episode reviews, Norman Sanzo, Silver Quill, Sapphire Heart Song and Torterra1324 review the 3rd Pokemon Movie Spell Of The Unknown. Come and join us, it's going be an amazing episode!!! 2011 - Someone created an @derpymail domain for email! 2012 - A billboard for the Royal Wedding appear in LA! 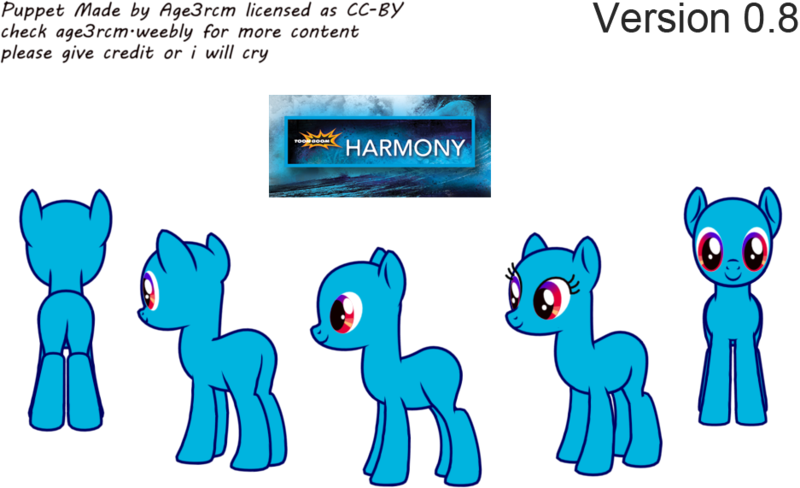 2013 - We discuss pony flavors. 2014 - The writers for the Rainbow Rocks shorts are revealed. 2015 - Equestria's latest princess revealed. 2016 - Secret Hitler gets a changeling reskin. 2017 - First news about the MLP Movie teaser is released. 2018 - Submissions for Doors 3 opens.